Having directed one of the best crime thrillers in recent years with The Chaser (Chugyeogja), Korean filmmaker Na Hong-jin sticks with the genre for his electrifying 2010 film The Yellow Sea (Hwanghae), which arrives on UK DVD and Blu-ray in March from Bounty Films. Gu-nam spends his time drinking and gambling as he attempts to blot out the wreck his life has become. His wife has crept over the border into South Korea and lost contact with him. His gambling debts are spiraling out of control. His self-respect is non-existent. As the pressure mounts Gu-nam's desperation escalates. Eventually he can see no way out other than to accept the offer of local crime boss Myun to follow his wife to Seoul where he must murder a businessman. Colourfully described by Kim Newman in Empire as "More startling than an unexpected punch in the noggin" and "a violent thrill-ride to a dark new corner of Asian cinema," the film stars Ha Jung-woo and Kim Yun-seok from The Chaser, as well as the same cinematographer (Lee Sung-je) and editor (Kim Sun-min). 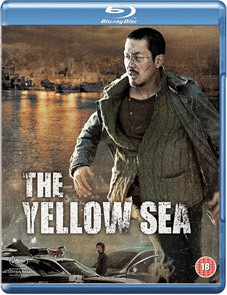 The Yellow Sea will be released on UK DVD and Blu-ray on 26th March 2012 by Bounty Films at the RRP of £18.37 for the DVD and £20.42 for the Blu-ray.